Bust 31.5", Waist, 24", Hips 33.5"
70s Lingerie, Retro Petite Undergarments Clothing Patterns - MISSES' CAMISOLE, SHORTS, BODYSUIT & HALF-SLIP Semi-fitted high waisted camisole has V neckline, and purchased ribbon shoulder straps. Boxy shorts has elasticized waistline. Semi-fitted high waisted bodysuit has V neckline, purchased ribbon shoulder straps, cut-away midriff. Half slip four inches (110cm) below mid-knee and in ankle length has elasticized waistline and side hemline slits. All have purchased lace trim. 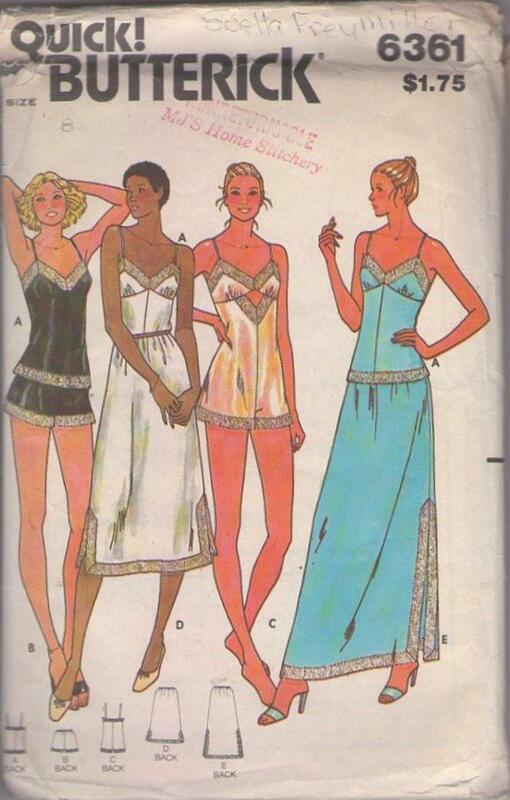 CONDITION: This original vintage sewing pattern is cut & used. All pieces appear to be complete and intact and have been neatly refolded with the original instructions.